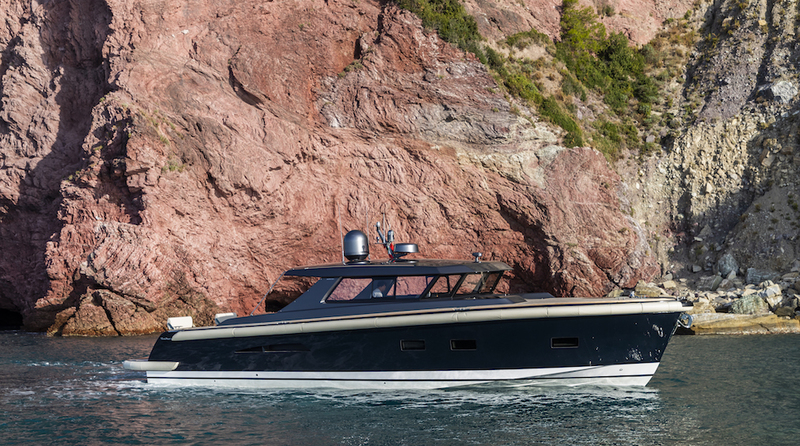 Nauta Design recently announced the launch of the Nauta Tender 48’, custom designed to be a sailing superyacht’s fast chase boat. 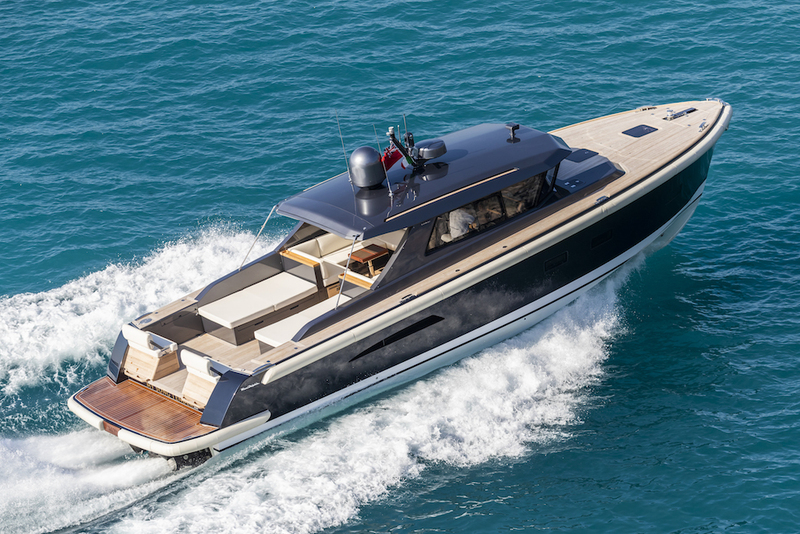 Built in Italy by Maxi Dolphin, a very reputable builder in composite, the Nauta Tender 48’ was created to meet the owner’s brief for a versatile boat that could be used in a variety of roles when the mother yacht is taking long cruises in the Mediterranean. 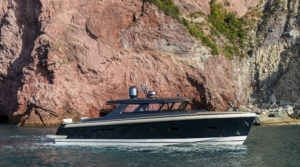 The owner foresaw using the Nauta Tender 48’ for scouting potential anchorages, for bringing guests ship to shore, for provisioning and for bunkering in ports that are too shallow for the mother ship. Occasionally the owner planned on using the tender for short, autonomous cruises. 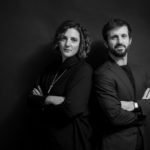 With this in mind, the aim at Nauta Design was for versatility. Nauta created a simple, elegant and well balanced exterior design that recalls a patrol boat’s approach to practical seaworthiness. A long rubbing strake elegantly underlines the hull profile and at the same time serves the practical purpose of protecting the mother ship when guests are boarding or supplies are being unloaded. The Nauta Tender 48’ is something more than a tender and can be used for logistics, for short transfers, for extra berths and as a pleasure boat in her own right. The cockpit has been designed for enjoying the sea from up close yet remains a protected spot in rougher conditions. 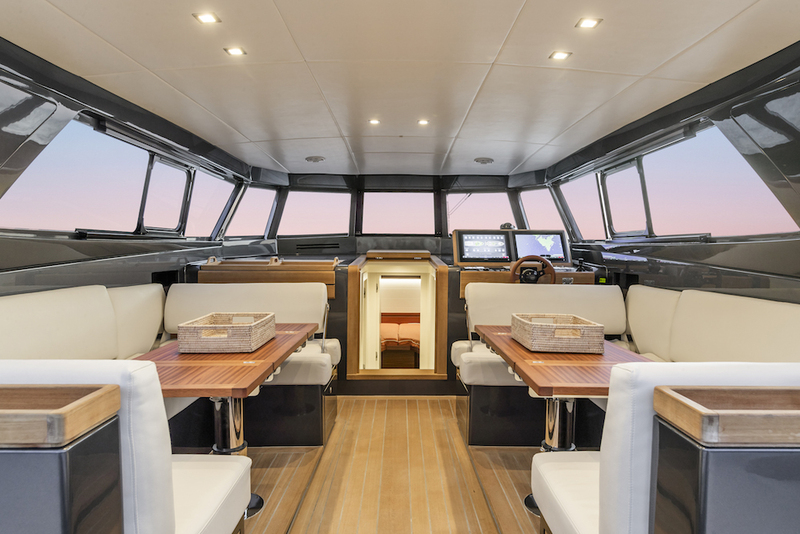 There are two large sunpads aft that extend to the shaded area under the hard top where there are two symmetrical seating areas around elegant tables in mahogany and raw linen laminated on carbon panels. The tables have adjustable flaps and extendable bases so that they can be used as dining tables, coffee tables or can even become the bases for more sunpads. When the comfortable cushions are put away, the cockpit can be used as loading space for bringing provisions to the mother ship. The bridge is fore of the cockpit. Unvarnished teak and composite finished in a metallic grey tone make this a strikingly beautiful as well as functional area. State of the art navigational and monitoring systems show how this tender combines it roles of both working and pleasure boat without compromise. 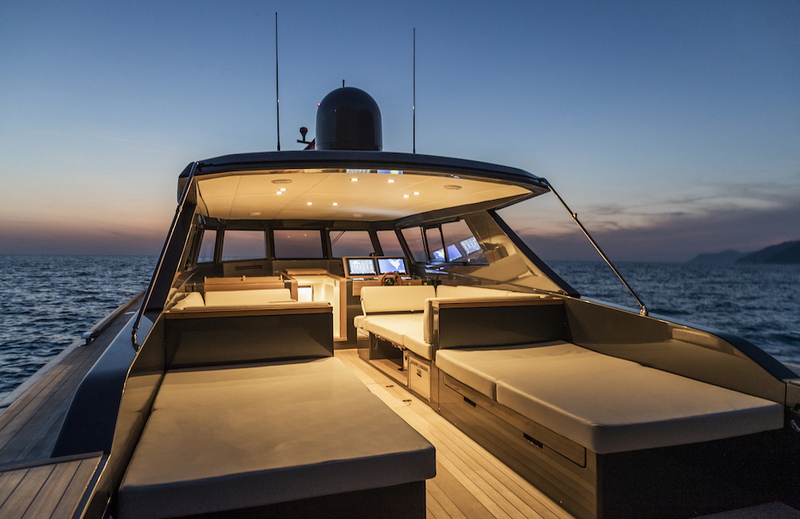 The glazed areas can be opened and have wipers and the windscreen is tilted forwards to minimise reflection from the boat’s electronics during night runs. Below deck there is an owner’s cabin fore, a galley and an additional cabin that can be used by crew or guests. All cabins are en suite and the interior layout makes rational use of space to maximize volume. The style is simple, elegant and welcoming with unusual materials such as laminated linen fibre used in the flooring , ceilings and countertops. Aft of the galley there is a large service space with a washer/dryer, a wine cooler, and the circuit panel. 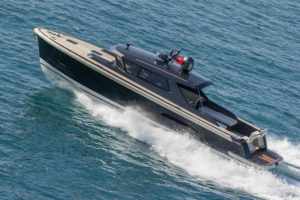 The Nauta Tender 48’ has two 600HP Cummins engines and Rolls-Royce Kamewa waterjets for a top speed of 37 knots and a long range so that she can always be at call while her mother ship is sailing. The tender also has oversized generators to serve the mother ship and to extend her silent period. The Nauta Tender 48’s hull is in fibreglass and Corecell sandwich for quiet navigation, but to assure strength at high speed it is reinforced with carbon fibre. 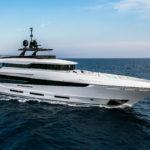 The deck and coachroof are in carbon fibre and Corecell for weight reduction and to keep the boat’s centre of gravity low in the point where its barycentre is highest. 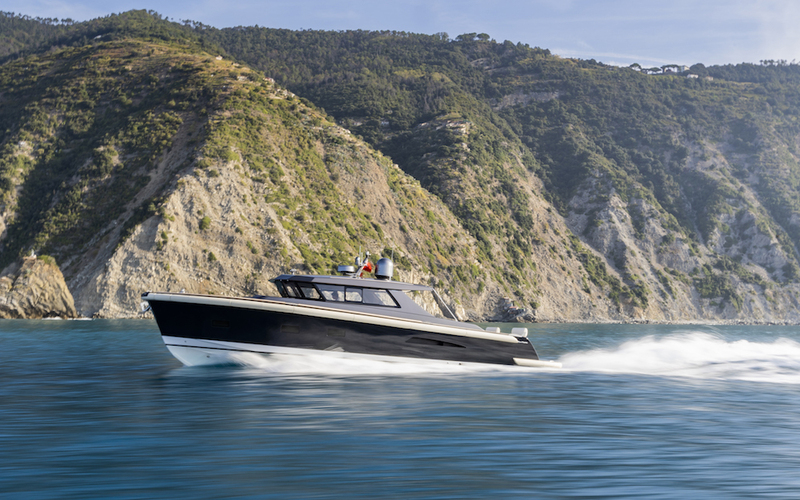 All of these features combine to make the Nauta Tender 48’ a performing tender/chase boat that combines elegance with versatility.